Mayor John Tory makes the pitch for a one-stop subway extension a day before Council is expected to debate the issue at Scarborough Business Association luncheon March 27. Photo via Twitter. There’s an old story about a town where the local mill ended every day’s morning shift with a whistle blast exactly at noon. It was so reliable that everyone set their clocks and watches by the noon-hour whistle. By and by, a visitor asked the mill manager how they always managed to sound the whistle exactly at noon. The manager assured the visitor that the mill carefully synched its whistle with the signal from the local radio station. The visitor then asked at the radio station if they could be sure their signal was accurate. Torontonians might well wonder if big decisions at today’s City Hall are being made in accordance with that same sense of rigorous analytical thought that governed the clocks in that apocryphal town. Consider the following: for years, politicians seeking votes in Scarborough have been declaring that Scarborough has been neglected by transit planners, that Scarborough “deserves” a subway, and that a subway will shorten commuting times. 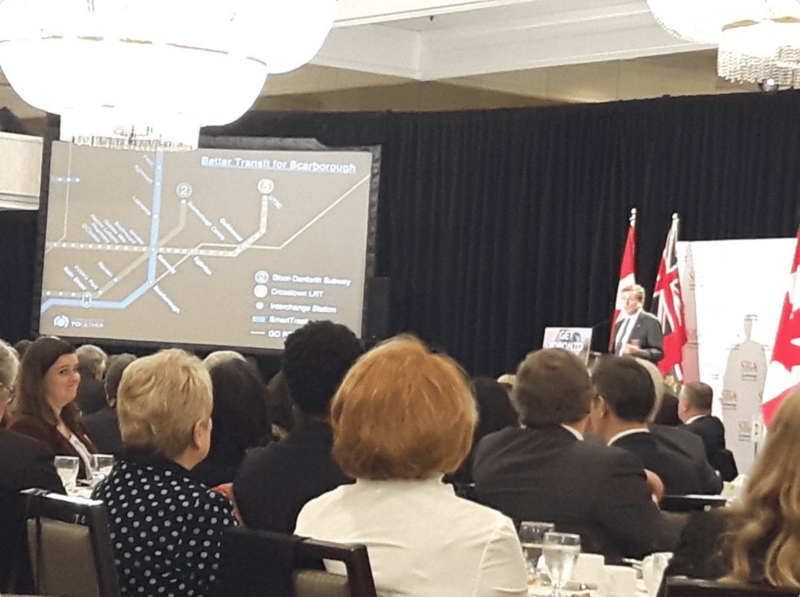 Recently, our mayor reported that, after listening to Scarborough residents, the accounts of their “learned experience” persuades him more than ever that a subway will speed up their commutes. Exactly what experiences have informed this learning about the benefits of a subway is left to conjecture. The one experience we do know that Scarborough residents have been living through, however, is that politicians have been saying to residents for years exactly what the residents are now saying to the politicians. 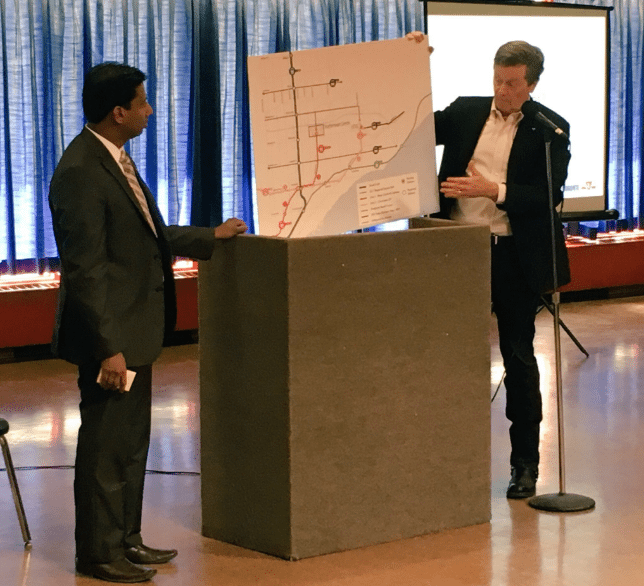 Councillor Neethan Shan (Ward 42, Scarborough-Rouge River) and Mayor John Tory at a transit townhall with Scarborough residents. Photo via Mayor John Tory’s Twitter. We all know, at one level of detail or another, why everything stalled for the ensuing four years. But in 2014, a newly elected mayor had the opportunity to resume work on the existing plan and bring a network of high order transit to Scarborough once and for all. He decided instead to endorse the transit vision of his immediate predecessor and commit the available funding to an extension of the Bloor-Danforth subway line. Two years later, Scarborough still sees no progress on any new transit service as Council has yet to settle on a route for the proposed subway extension. As projected costs mount, some commentators suggest that maybe a surface rail network deserves a chance after all. 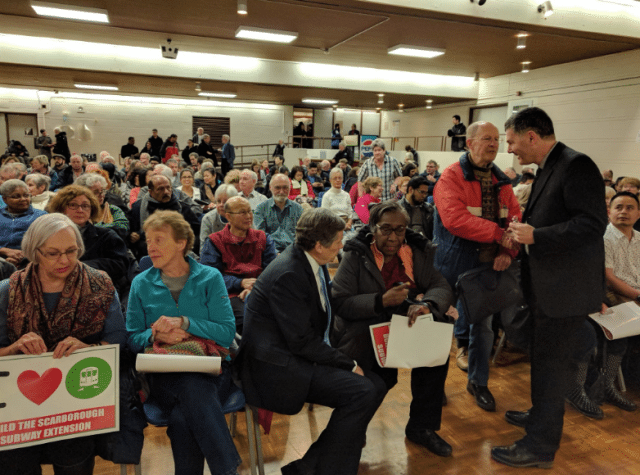 Mayor John Tory tries to convince Scarborough residents that a one-stop subway plan is in their best interests. Photo via Mayor Tory’s Twitter. Of course, the estimated cost of the project has grown higher with each successive review. It is now approaching the point where it will gobble up the entire budget originally approved for the subway extension plus local LRT line. And, equally predictably, it is not the costly subway extension but the less costly LRT line that is dropped in order to keep the project’s cost within the original total budget. The above-mentioned two recent columns in the Sun and the Star dovetail neatly (interesting how that happened) to make one essential point: the people of Scarborough want a subway, politicians at three levels of government have committed to spend your money on a subway, and we have lost the chance to work from existing plans if we decide to go with surface rail anyhow, so a subway it has to be; the cost be damned. One member of the mayor’s executive committee contributed the helpful observation that a one-stop subway line will get Scarborough residents downtown faster than a multi-stop line. Of course it will; once they have taken the bus to get to the station at Scarborough Town Centre or parked their cars and walked to the station after driving to the parking lot through streets that will be clogged with more buses than ever full of other commuters heading to the same station now that the existing SRT stops have been shut down. All of which ignores the further question: is the only purpose of transit service within Scarborough to give residents in the Scarborough Town Centre vicinity a quick exit out of Scarborough? Is this really how we commit to spending at least $3.5 billion in this city? Former mayor David Miller recently went on record to remind us that the people of Scarborough weren’t necessarily fixated on a subway, per se, until the politicians started talking up the subway proposal. Not so long ago, Scarborough residents were equally supportive of a surface rail network. It all depends on where the particular Scarborough residents you consult happen to live and how fully they understand the alternative transit proposals to be considered. Miller also reminded us of the number of Scarborough communities that would have been served by Transit City by now, including the two college campuses and the residents of high needs communities that will be stuck with buses for another generation or so as all of us wrestle with the cost of the subway extension on which construction has yet to begin. Miller’s bet is that we have not heard the last of the cost increases and the entire project will collapse under the pressure of its inevitable price tag. In a province that is broke and going deeper into debt, in a country whose federal government is on the same trajectory, who can be sure he isn’t right? The reasoning that is laid out in the mayor’s recent Sun column is almost as troubling as the conclusion that it reaches. From the pen of a former president of a publicly traded business corporation we get neither a technical justification nor a business case: we get political spin. It’s as though as long as it resonates well with the focus groups, it’s good policy. Try to imagine the president of a major corporation pitching a $3.5 billion proposal to his board of directors in the terms used to support this project. (while bypassing Scarborough communities along the way). More trains will have to be purchased and operated in order to maintain service intervals, adding to TTC operating costs. and they will likely do so by car or by bus, which will add to road congestion, rather than reduce it, and will make their commutes less satisfactory, rather than better. Or they may just give up on transit altogether and take the car to their destination. In as much as Toronto property taxpayers already pay a surtax (“transit expansion levy”) to fund this proposal—and last week’s federal budget fell far short of addressing Toronto’s financial pinch—any other unmet municipal need that you can think of will be subordinated to the cost of adding this one stop to the Danforth line. The first casualty is Scarborough itself. The Eglinton East LRT that was proposed in an earlier iteration of this same proposal was jettisoned to fit the project within the available funding envelope. It actually would have benefitted a number of Scarborough communities, but it now shares space in Toronto’s scrap-heap of imagined but un-built transit proposals. Scarborough is a community of many charms. It is also a victim of the worst of post-war urban planning. It has many wide avenues that defy pedestrian activity and vast parking lots fronting the strip malls alongside them. The most tragic example of Scarborough’s capitulation to parking lots is the area around the Warden subway station itself, where the nearest residents have to make their way through acres of parked cars to cover the distance between the station and their apartment building. Scarborough has the potential to transform itself into a community that welcomes human activity at least as much as car traffic. Surface rail is the key. With a network of surface rail, people who are trapped in isolated communities will become better connected to the rest of the city. Multiple stops that serve communities will get buses off the roads and will get residents out of their cars. Over time, areas that now consist of streets lined with strip malls and parking lots can become environments that are places to be—not places to drive past—and become the kind of places that we envy in other cities. It may take a long time, but it can happen. But not if we sink all of our available resources into misbegotten projects about political hubris instead of civic vision. Extending the Danforth line will make some commutes better for some people in Scarborough. Maybe for a lot of them. But then, so will a network of surface rail. A network of surface rail, however, will make more commutes better for more people in Scarborough. In more Scarborough communities. And it might even leave more money available to address other needs. Beyond that, a network of surface rail will lay the planning foundation that will help make Scarborough a better Scarborough. Adding a single stop at a cluster of buildings more than six kilometres—almost four miles—from Kennedy station won’t do that. Decades from now, anyone living in a community served by a well-planned network of surface rail will be glad that City Council had the foresight to build the system and would be shocked to learn that it was ever the subject of a hotly-contested debate. It’s time for Toronto City Council to stand up for Scarborough. It’s time for Toronto City Council to show respect for taxpayers.